Hi everyone! Joaninha has been exhausted with work and training for the past few weeks (she slept for 15 hours last Saturday), not to mention catching up with all her Canadian friends, and apologizes dearly for having unintentionally lead you on regarding her return! I’m her hitherto unknown alter-ego, A. B. Ghinner, and she sent me to write a guest post in her absence. Don’t tell her I told, but she’s been complaining about her performance in the roda lately, so I’m writing a post to help with that! Now, I don’t know that much about capoeira rodas, but the point is to maintain the circle, right? In that case, she’s actually pretty good! In fact, I’ve put together this fabulous guide for you guys on how to rock the roda, based on my observations of her alone. You’re sure to learn tons from it—and no need to thank me! 1. Watch the games, clap to the music, and sing along to the songs. 2. Be polite and “let” people go in front of you. 3. Shift your weight from foot to foot. Constantly. 4. Create a mental flowchart of conditions for buying in, and don’t even think of deviating from it. 5. Mentally organize every other capoeirista present into order of preference for playing against. 6. Hover on the edge of the roda, preferably directly behind one or more large, shirtless, sweating men whose eye-levels you are literally below. 7. 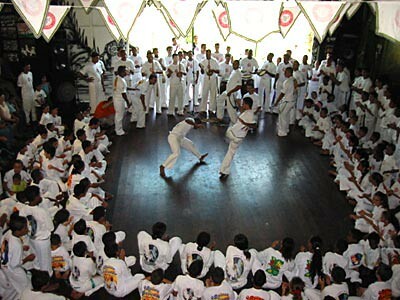 Attempt to put every capoeirista with a higher belt between you and the bateria. 8. Failing that, continually take one step towards and two steps back from the bateria/pé do berimbau. Reverse direction when you reach the other side. 9. As a last resort, practice the cha-cha or salsa steps right at the entrance to the roda. 10. Do not, under any circumstances, actually go into the roda and play. Well, that’s it! Easy, right? You could get through a roda like that blind-folded! Although I have to admit, she only does about half of those things, but I hope my own ideas will work just as well! Be sure to let her know if they do; I’m sure she’d be so pleased. 🙂 It was great meeting you guys, and I’ll see you around! Hilarious! I do all those things, so I guess I’m doing quite well! That was by far the funniest, and yet truest thing I’ve read today 😀 Thanks for a good laugh. By the way, I left a comment on your blog that had 3 links in it (relevant/legit ones! ), so it might have gone into your spam queue. Just a heads up!